Verdict: Camping. The sound of flip-flops and zips, and breakfast with a view. Camping is hard to beat as a family holiday option. It’s cheap, flexible and offers a simple, outdoorsy life that’s so refreshing in a world of addictive devices, strict family timetables and seemingly endless homework. We love: The freedom, flexibility, fresh air .. and price tag … plus the element of mild adventure! As a family we’ve glamped (in yurts, safari tents and other ready-made tents), campervanned, camped under canvas and even wild camped. Admittedly, I’m more of a natural glamper than a proper camper (I prefer walls, maybe some storage and definitely a loo to a roll mat under canvas and a schlep to the toilet block) but some of our best holidays have been camping trips. And, let’s face it, campsites often pop in the best locations! In 2014 we bought a campervan online. It was a slightly deranged decision, as it was the other side of the country and the first time we saw it was when it was delivered. Luckily, Fran the van worked out ok.
She did smell a bit (we never quite managed to shift the lingering smell of cigarettes), the seats weren’t the comfiest, the cupboards definitely weren’t the roomiest (not surprising, as we needed a wide bench seat for 3 bums) and there was no air con, BUT she proved the perfect way for Garry and I to get a little bit of adventure into our holidays while still offering some familiarity for the (still smallish) kids. We’ve now done enough camping of all kinds for everyone to know what to expect — a huge benefit, in our experience — and we’ve all loved the freedom and fresh air of a camping holiday. Apart from freedom and fresh air, the best thing about camping or campervanning is the flexibility it affords. Don’t like a site? You can usually find another one pretty easily. Weather a bit grim? Move on. Generally, we’ll mix up our accommodation, combining mainly camping with the odd bit of glamping or night in a hotel, which increase the price a bit, but basically camping has been a great way for us to have long holidays without a huge price tag. So, 2016 saw us ferrying to Santander and then making our way slowly back in the van via the Picos di Europa, Bilbao, midi Pyrenees, South West France, the Dordogne and the Loire, while this year we opted for a French / Corsican loop via Reims, the French Alps, Corsican coast and mountains and finally the Ardeche. Our favourite camp-sites have a pool (but not necessarily a pool complex, which is a whole other thing!) are small or medium-sized and offer plenty of chances to bomb about on a bicycle. I also have a (not unreasonable, IMO) thing about soap and loo roll in the loo blocks. French camp-sites are all brilliant, especially away from the coast, and we’ve loved most of our French camping and glamping experiences. 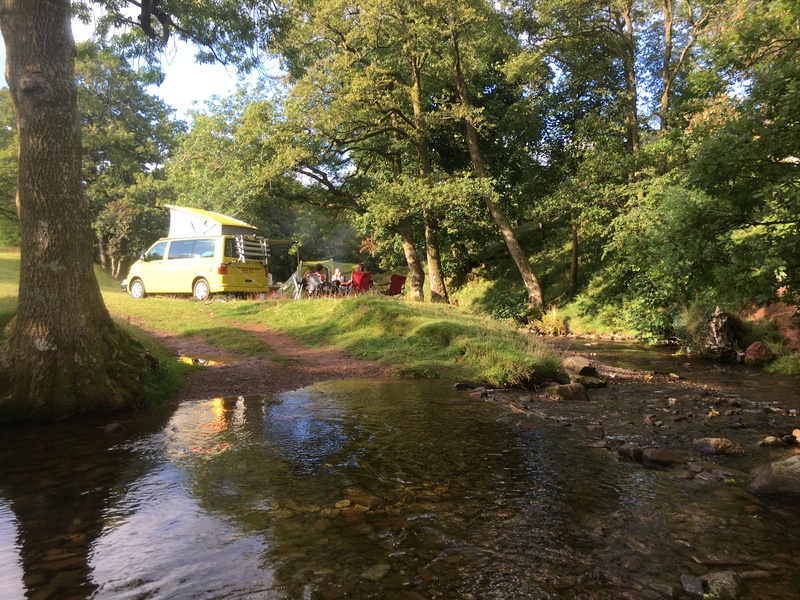 We’ve also camped at a music festival (our first, Womad, this year) and at a literary festival (Hay on Wye this year, in the van), wild camped (in the Brecons, last year) and glamped in a baffling array of luxury safari-tents, yurts, mobile homes and huts. Camping life is wonderfully slow. You can while away the time playing cards or Bananagrams, or reading in a hammock. — we know we’re pitched when the hammock goes up and the books come out. More active outdoorsy camp sitey things include (of course) swimming and cycling, and there’s usually a table-tennis / badminton / basketball / football / swingball / cricket / boules / table-tennis option, as well as the occasional opportunity to mess about in some water, or simply while away some hours making a collection of pine-cones … for our kids camping offers a rare chance to unplug and relax. I love everything about campervanning. Except driving around in the van … and also, sleeping in the van. To be fair, this was a genuine baptism of fire, as we’d only had the van a month or so, it turned out be fairly basic (we bought it blind), the kids were small (11, 8 and 5), it was HOT and we had no air conditioning. Or furniture. Or, I think, a fridge. Of course, we now all look back on that first long trip fondly — and it was amazing — but it was also quite full-on and hard work at times. Sunny the new van. So posh! (Since then, we’ve upgraded the van for more comfortable seats / beds and air conditioning, plus we’ve all got used to our van trips). So what are the downsides? There’s always the faff of setting up (unless you are a very lean outfit or have a motorhome like the ones we often covet on campsites), while making it up as you go along can take time, relies on good communications (campsite wifi is not generally the best) and does mean the odd panic about finding a last-minute pitch. Does it count as wild camping if you take one of these with you? Finally (and probably the main one for me), camping is not luxury! It’s noisy, often busy, all jobs take longer than at home because you don’t have any mod cons, there’s the night time schlep to the loo block to contend with, and on some sites and there is a LOT of queuing (for showers, washing machines etc). The best campsites let you light a fire for toasting marshmallows, drying socks etc. Books like Cool Camping are really useful, and we’ve also used Pitchup.com and the Alan Rogers website. Break up the trips with the odd night in a hotel 🙂 or night in a glamping unit. Eurocamp Independent are helpful, or you could try the Yelloh, Flower or Indigo groups in France for glamping options. We’ve used ferries in the Med and to Spain to move around Europe. Ferries direct.co.uk is helpful when planning a route. You can book overnight cabins to save daytime travel time. If you are a family of five it can be tricky finding a small campervan to fit three children in. They do exist but it means compromising on storage — our current van has no cupboards at all but we can all drive around in it comfortably and sleep the odd night in it without having to pitch a tent (it’s a squeeze — 2 in the roof and 3 in the bottom). Otherwise, you could consider a 5 or 6 berth motorhome which is a roomier option but a little less nippy and flexible. You could always start by hiring a couple of options to see how you get on (we did this for our H – see below).